Suited and booted at the Oktoberfest is all very well, but you still need the right headgear to perfect your costume. This traditional costume hat by Krüger Mädl stands out thanks to its high quality and its classic design. Made from natural wool felt, the hat is extremely comfortable to wear and always keeps its form. An internal drawstring ensures additional comfort for the wearer, allowing you to discreetly adjust its width to suit the shape of your head. 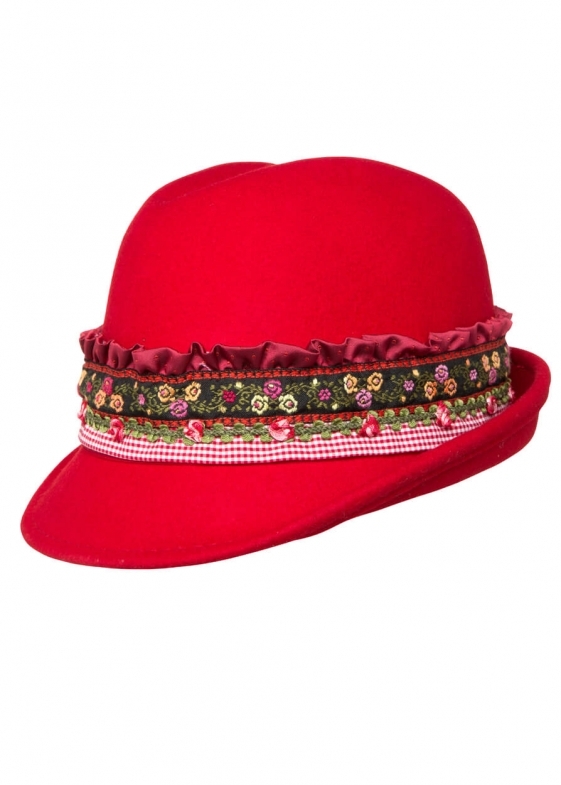 The broad, adjustable and colour-coordinated hatband adds a pretty touch. Soft ruffles, pretty flowers and a delicate checked pattern emphasise the hat’s feminine character and are the perfect choice for style-conscious dirndl wearers with a sense of tradition. In traditional red, it’s a perfect choice for parties that are full of joy!